NOW USING GPS, ACCELEROMETER and ACCELSERVICE!! 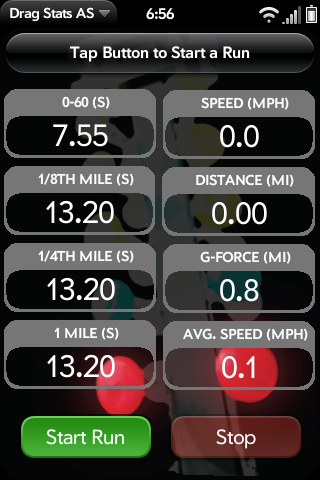 Also added ability to switch between miles and kilometers as a base unit. Added Start countdown and made it look a little better. Seems to be more reliable than waiting for initial acceleration. Also, gives the opportunity to include the driver's reaction time. Basic 0-60mph timer, 1/8th and 1/4th mile distance timers, speed, average speed (hopefully works) and g-force meter. Once you start the app you need to keep it still in the same position in your vehicle for the 0-60 time and g-force meter to stay calibrated. There is a small nmber in the upper left corner that shows dynamic accelerometer polling times. I haven't tested this version fully yet but everything seems to be in working order except the stop button is still buggy. I will fix this soon enough. Plan on adding other features and really cleaning it up if this very basic one works well for most people. Simply press the button and once you start to speed up it will start timing and tell you how long it takes you to get to 60mph. *Working on choice of distances timed (in case people aren't gonna go a full mile).